A couple of nights ago, along my web travels, I came upon Tatkrazy's blog. She had some really interesting posts about tatting in Japan. She also had a link to her website about American Tatting Shuttles where she writes about shuttles and also has some stories about American Tatters. And this is where I saw a pattern that had been tatted by her Aunt Stella. It was love at first sight! I just loved the look of this motif and how it combined together. I wrote to Tatkrazy and she was incredibly helpful and very kindly shared the pattern with me (which originally came from a Work Basket magazine). Impatient as I am, I had to set to straight away and tat one motif. The pattern is called "Snowflake Motif"
but it reminds me more of little leaves combined with flowers. and how lovely the bunches of small leaves look. And now back to the doily. Can you say which Workbasket edition this is in? The pattern is beautiful! 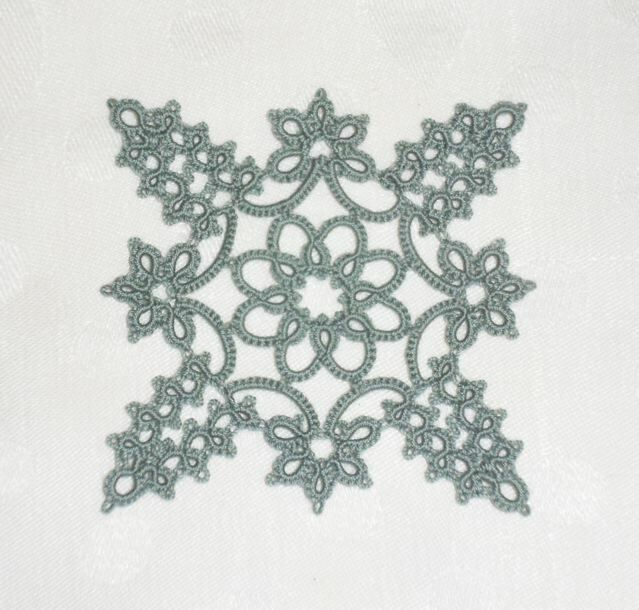 Very pretty pattern... and your tatting is beautiful as always! Nautical Knitter, I don't know which Workbasket edition but it was reprinted in Aunt Ellen's Treasury of Tatting Patterns which is still available second-hand on Amazon. I've asked Heidi if she knows and if I find out about the magazine, I will let you know. Well - I LOVE it - so much that I have found the least expensive of the Amazon second-hand books and have it on order! You have tatted it beautifully and in a wonderful colour thread that really showcases the pattern. It is a great inspiration for me. 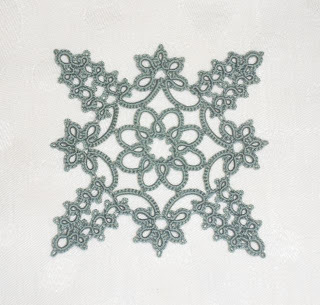 I will be practicing my tatting stitches diligently so that I will be ready to address the new pattern when it arrives! It's lovely, and so unusual. I'm looking forward to seeing the patterns that result with multiples.